I took three years of Latin in high school and loved it. I also took Greek for a couple of semesters in college and thoroughly enjoyed that as well. But when it came time to pick a language to study with my own homeschooled children, I opted for… Spanish. Here in Texas, opportunities to converse in Spanish abound. Classical languages? Not so much. Even so, I haven’t wanted to abandon my Latin and Greek roots completely. Thankfully, vocabulary-building curricula such as The Critical Thinking Company’s Word Roots are ready to stand in the gap. 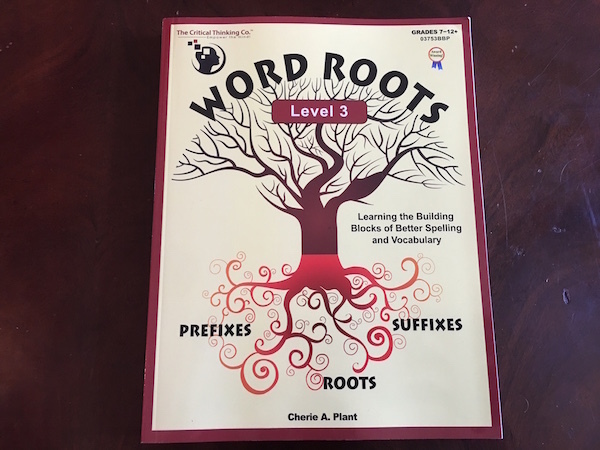 I’ve tried a variety of programs, games, and workbooks in the past to teach Greek and Latin roots, but I didn’t realize the Critical Thinking Company had recently updated and expanded their Word Roots curriculum until Timberdoodle offered to send me a copy of Word Roots 3 to review with my kids. As I’ve mentioned before, we’ve been longtime fans of Critical Thinking Press books, so this one was a welcome addition to our library. There are several things I like about this program. First, it can be used by a wide range of ages. There are four books in the series, designed for teaching students in 5th through 12th grades. This is always a plus when teaching as many grade levels as I have — students 10 years old and up can all follow the same program. 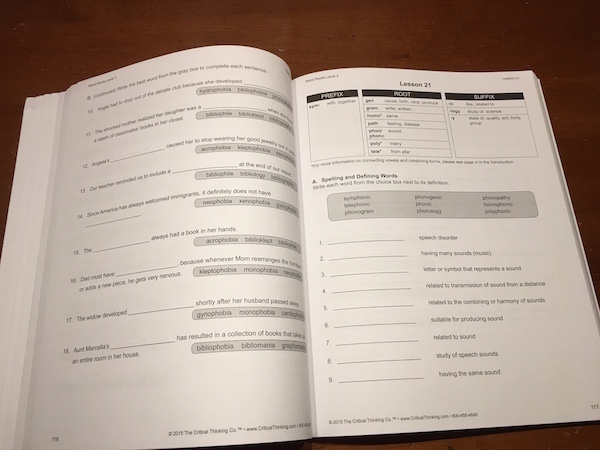 And since the pages are reproducible, you can save money by making copies of the worksheets instead of buying individual books for everybody. Second, the exercises are fun. My kids especially like the word scrambles. Several different activities are used to teach the vocabulary words in each section. Some appeal more to some kids than others, but the variety does a great job of reinforcing learning. 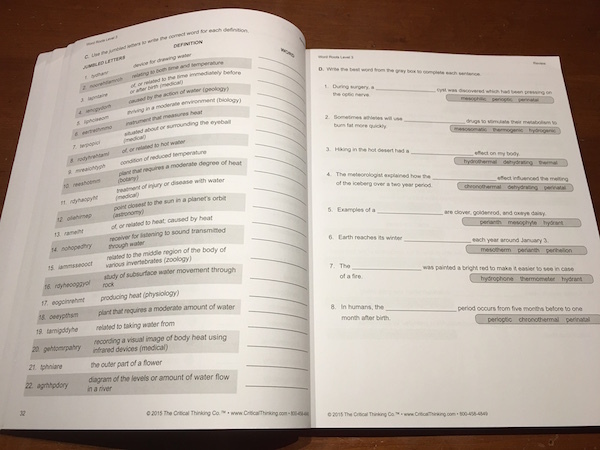 There are even writing exercises included. And last, studying roots not only builds vocabulary, but it improves spelling and reading comprehension, as well. 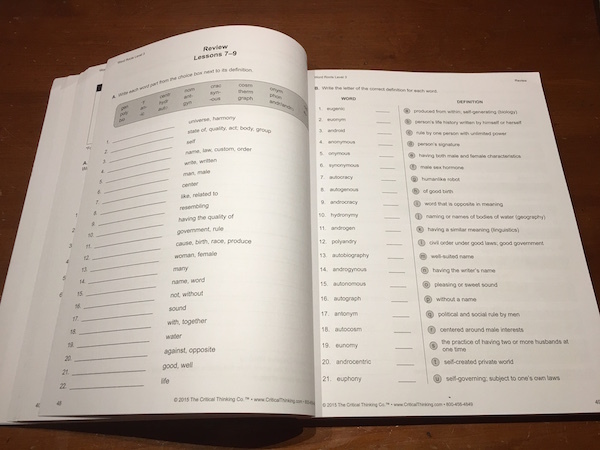 It’s good for high schoolers who’re preparing to take their SATs, but it is equally good for older elementary students who are still working on decoding skills. I love it!